Pragmatic Play present a slot game in the mining genre, played across five reels and three rows, with 25 paylines and an RTP of 96.5%. The famous California gold rush at the turn of the 20th century is the inspiration for this online slot, with offers players an innovative free spins mode as a bonus feature. The best place to play this slot game is with us at UK Slot Games, where we also offer over 600 slot games, including ‘Starburst’, ‘Rainbow Riches’, ‘Fluffy Favourites’ and ‘Bonanza’. The California Gold Rush was a major event in the history of the United States of America. For a short period in history, everybody thought they could make themselves rich by heading down to the mines and digging up rocks of pure gold. It’s also where the phrase ‘the luck of the Irish’ comes from; rightly or wrongly, Irish immigrants were perceived to be particularly good at locating the precious nuggets. There are plenty of slot games which are themed around the luck of the Irish. There may be even more which are themed around digging for gold. When you take a second to think about it, that makes a lot of sense. The people who went down into those mines were taking a chance, digging away in the hope that the next blow of their pick axe might find them riches. Isn’t that what all of us are doing when we play slot games? All of us who play and love these games are digging for or own gold. All Pragmatic Play have done in creating this game is make the metaphor almost literal. The reels in Gold Rush! (that exclamation point is important; there are a lot of games that share the same name, and the exclamation point marks the Pragmatic Play game out as being different. We’ll talk about the other games a little later on) are set at the entrance to an old, ramshackle wooden mine. It’s a simple but effective theatre of play, allowing the reels to spin around within the mine’s darkness. The backing soundtrack is atmospheric and effective, combining gentle banjo music with the noise of physical labour happening within the mine. On the reels, the traditional playing card symbols make up the lower values, running from 10 through to A. Above them we have some mining tools, a gas lamp, a wooden cart piled high with golden nuggets, and most valuable of all an old, bearded prospector with his axe over his shoulder and a lump of gold in his hand; which probably explains why he’s smiling! In short, the symbols contain everything we need in order to go mining. The wild in Gold Rush! is a bunch of dynamite sticks, which substitutes for everything else other than the scatter symbol and create winning lines for you. 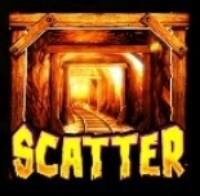 The scatter itself is an image of a tunnel within the mine. You’ll definitely see it if it appears on your reels; it has the word ‘SCATTER’ printed across it in golden lettering. The scatter is also the way into the game’s bonus feature, so it’s time we talked about that. Gold Rush! has one bonus feature, but it presents it with a twist and provides plenty of opportunities to find big wins if your luck is in. Free Spins: Free Spins is the feature on offer. For a game released in late 2017 that’s no surprise; most online slots that offer bonus features will offer a free spins round of some description. So what have Pragmatic Play done to make this mode different? Well, it’s all about the extra symbol. First of all, you need to trigger your free spins round. You do that by landing three of the tunnel scatter symbols anywhere on the second, third and fourth rows. That gets you ten free spins to start off with. Every time you find an additional scatter symbol during your free spins, you’ll receive two extra spins. That can keep the round going for quite a long time if things are going your way. When the round is up and running, keep an eye out for a new symbol; a golden nugget. Just like in a real gold mine, you’re trying to collect these to make yourself rich. The more gold nuggets you collect, the more prospector symbols are added to the reels. Remember, the prospector is the most valuable symbol in the game, so the more you have when you spin, the better the prizes will be! When you start your free spins, the game will add seven additional prospectors to the reels. When you’ve collected five gold nuggets, you get an extra sixteen prospectors. Make it to ten gold nuggets, and you’re now up to twenty one additional prospectors. If you’re an exceptionally good gold digger and find fifteen gold nuggets, there will be twenty nine more prospectors on the reels than they are in the base game. That means you should win almost every time you spin! The key to success in the free spins round is finding a healthy balance of fresh scatter symbols and gold nuggets. All the nuggets in the world are no use to you if you run out of free spins, so you’ll want to see both on a regular basis. A quick look at the gaming portfolio of Pragmatic Play, who were founded in 2007, tells you that they’re a design company with a theme; all of their games have a definite visual feel to them, and many of them use the old West as a setting. They have over 100 games on their roster, the highlights of which include Wolf Gold, Gold Rush! (of course), da Vinci’s Treasure, Great Rhino, Madame Destiny and Peking Luck. We think the free spins round requires a little more explanation than they’ve given it; so it’s a good job we’ve already covered it for you here in this review! It’s a fun game that’s easy to play and understand, keeping it simple with the bonus features, but also managing to add an original twist at the same time. We mentioned a little earlier that there are a number of games which use the name “Gold Rush”, belonging to a number of different slot game developers. We’ll look at those in a moment, but before we do, we’re going to look at Pragmatic Play’s own roster of games to see if they’ve come up with a sequel, or another game which uses the same theme. There is no direct sequel to Gold Rush! just yet; the game was only released in late 2017, and in any event, Pragmatic Play have thus far not shown much inclination to release direct sequels to their existing games. They prefer to develop original titles, and when they do return to a theme it tends to involve animals, for example Wolf Gold and Mustang Gold. That being said, there is a linked game among their catalogue, as well as a couple of other takes on the theme of hunting for gold. This isn’t a slot game; just a video version of an old-fashioned scratchcard. It’s set in the same world as Gold Rush!, and uses several symbols that will be familiar to Gold Rush! players (as well as the theme), but that’s all it has in common. As it’s a scratchcard, it has no bonus features or additional games of any kind. It probably won’t hold much appeal to people who enjoy the slot game; unless of course you also enjoy playing scratchcards. If the idea of going digging for gold feels like too much work, you could always try stealing it from dwarves instead. In this slot game, four dwarves have gone out partying and left all their golden treasure at home. All you have to do is find it! This is a 5x3 slot with an RTP of 96.64%, and a free spins round that comes with a multiplier. The mechanics of the game are similar to Gold Rush!, but the free spins mode isn’t quite as much fun. Also, stealing gold from people rather than digging for it yourself feels a little dishonest! There are other ways to make a fortune than digging for gold. You could become a treasure hunter, like the character of John Hunter is in this slot game! There’s an ‘Indiana Jones’ feeling about this online slot, which is one of the games that Pragmatic Play are best known for. The layout is 5x3, with an RTP of 96.53%, and the game features a ‘map quest’ bonus feature and a wheel of fortune, as well as some additional randomly triggered bonuses. If you particularly enjoy extra features, this might be a game you want to consider. On the other hand, it might be a case of a few too many bells and whistles for some players. We promised we’d tell you about the other games out there called ‘Gold Rush’, and so we will. Gold mining is a popular topic for slot games, and it seems ‘Gold Rush’ is the most popular title within the genre. They all have their own individual charm, but it might be best if people stay away from the name in future in order to avoid confusion! This might be the best known ‘Gold Rush’ game, other than the Pragmatic Play one which we’re reviewing. Just like the Pragmatic Play game, this is a modern video-based online slot, with some entertaining graphics and nice bonus features. The visual theme is very similar to the Pragmatic Play game, if a little darker. The reels are in a 5x3 layout, and the RTP offered is 95.79%. Expanding wilds make finding winning lines a little easier; and a prize-picker bonus feature allows you to dig in one of three mines for treasure. The mines have different values, but if you choose to chase the top prize, you have to accept your chances of finding it go down! We honestly couldn’t say whether this is better or worse than the Pragmatic Play game; they’re both fun to play, and that’s why we offer them both to players on ukslotgames.com! This is an old game; old in terms of the fact it was released several years ago, and old in terms of its layout and design. Rival’s version of Gold Rush is based on the old one-armed bandit physical slot machines, with 3x3 reels and only one payline. As you’d expect from a game aimed at the traditional end of the market, there are no flashy bonus features or side games; just a wild that’s there to boost your chances of a win. It’s simple, and it might be too simple for some players, but the RTP is a fair 95.94%. Habanero are a lesser-known slot game developer, but their entry into the ‘Gold Rush’ cluster of games stands up well. It’s a slickly-designed and good looking video slot, with a 5x3 layout of reels, 25 paylines, and an exceptionally high RTP of 98.1%. Like the Pragmatic Play game, there’s a free spins feature, with the added twist that the last free spin triggers a ‘mine collapse’, where random symbols will fall in from the roof and appear on the reels. The game is also linked to a progressive jackpot. Between that, the wilds, the scatters, the bonus feature, the multipliers, the gamble feature and a few more twists, there’s a lot going on in this game; probably too much for some! From the complex and deep world of the Habanero game, we go back to the basic and simple with BetConstruct’s take on the theme. Like the Rival game, this online slot is designed to look like a physical slot machine, and it very much looks like something from a previous era of gaming. There’s a 5x3 layout with 9 paying lines. Unlike other games which model themselves on physical slot machines, this slot does offer a couple of more modern features, including a free spins round with a multiplier attached to it. Unusually, the RTP for this game doesn’t seem to have been published anywhere, so it’s impossible to know how generous it actually is. When we talked about Pragmatic Play as a developer earlier on, we mentioned that they consider themselves the master of the mobile slot. They say they design all of their games to be played on mobile devices first, and then when they’re happy with them they work backwards to make them playable on computers. Bearing that in mind, and taking into account that Gold Rush! was launched at the very end of 2017, we expect the game to work perfectly well on a smartphone. So are we right? Yes, we are. Once again, Pragmatic Play have created a seamless transition between the world of online slots and the world of mobile slots. Everything from the graphics to the sounds are exactly the same on a phone as they are on a computer. Nothing has been lost, there’s no issue with scaling the graphics, and the game is crisp and clear. There’s no disadvantage to playing the game in either portrait or landscape mode, either. If you flip the direction of your phone, the screen will quickly and easily rearrange itself and relocate the buttons, without creating a break in play. Not every developer has been able to master that process yet, so Pragmatic Play should be congratulated. All that’s lost in landscape mode is an image of a railroad running below the reels, and whilst it’s nice to look at, it doesn’t add or take away anything from the game. If you enjoy the computer based-version of Gold Rush!, you’ll be equally happy with the mobile version. Pragmatic Play have done themselves proud, just as they usually do. Pragmatic Play have a reputation for releasing quality games. Because of that, nine times out of ten, when they have a new release to offer, the industry press want to know about it. Gold Rush! was no different, with several respected industry websites and newsletters keen to give everybody their thoughts on it. Calvin Ayre is an entrepreneur with a number of links to the slot game and casino world, and if a slot game interests him, he’ll often cover its launch on his own website. He must have been really impressed with Gold Rush!, because he printed the entire press release for the game when it was released. Ayre doesn’t give his own thoughts on the game, but in the press release Pragmatic Play are keen to draw attention to the game’s free spins bonus. In broader terms, they point to their increasingly prolific output, with two fresh slot games released every month, and describe themselves as the fastest growing developer in the whole industry. Another widely-read industry publication is Casinopedia, a website that works like a Wiki for the gaming world, and likes to give its thoughts on anything that it considers to be big news. Their staff took the time to give the game some extended play when it first came out, and in their review they describe Gold Rush! in glowing terms, saying that it’s ‘fun, eye catching, and most importantly easy to pick up’. The end of that sentence hits on an excellent point; slick design is nothing if nobody understands how to play the game. Pragmatic Play seem to have got the balance right with Gold Rush! 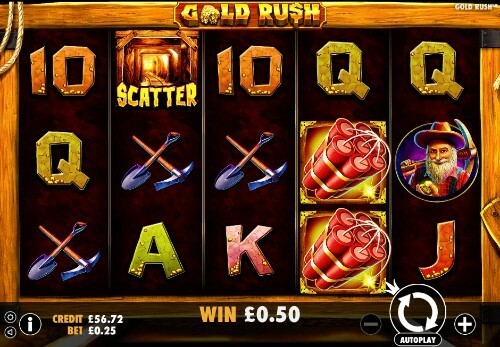 Why Is UK Slot Games The Best Place To Play Gold Rush? Ready to pick up your axe and take a swing at the reels? Well, don’t do it literally, load the game instead and play it the usual way. We wouldn’t want you to damage your phone or computer! This online slot is well thought of, well reviewed and popular among players, so if you’d like to give it a try you’ll be joining a community of happy gamers. 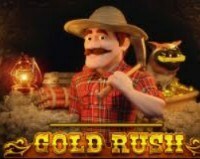 When you decide to join the gold rush yourself, we’d like you to do your digging with us at ukslotgames.com. Secondly, we don’t force you to deposit money when you first sign up. Everybody is welcome to make an account, and you can then browse our entire catalog to find a game you really want to play before you hand over any money. Gold Rush! is a fine place to start, but there’s no reason to stop there! In fact, we do the opposite of forcing you to hand over money. When you sign up, you could win up to 500 free spins on our games just for doing so!